My Weave Review! Hair secret revealed! So I promised you all a blog post on my freshly transformed hair! Is it a perm? No. Clip in extensions? No. All over colour??? No. Is it a wig? NO ! I got my weave done with Tanya at http://www.weavesthatlooknatural.co.uk and here is all about my experience so far ! …..
What exactly is a weave you ask… Well I wondered the same thing when I came across some amazing hair transformations whilst researching. It turns out that a weave is basically what every single celebrity have done, well my fav celebs anyway – Beyonce, Kylie Jenner, the Kardashians, J Lo, Nicki Minaj…. I could go on. That is why they can so frequently change their hairstyles – and without damaging their own hair. It is a technique that involves your hair being corn rowed then wefts of hair extensions being sewn on. The exact technique used on mine involved the outer hair line and my parting at the front being left out and then the bulk of my hair being plaited to my head. Then a net was sewn on to keep the hair flat, secure and to provide a sturdy base for the bundles of hair to be sewn onto. The type of hair I chose was virgin brazilian in deep wave, 24 inches to create my look. it comes jet black then is bleached to achieve the desired colour. I bought 3 bundles. How then has my natural straight dark hair that is left out blended in? Well I kept the roots dark and then Tanya at weavesthatlooknatural.com lightened the ends to match the hair THEN she taught me a special curling technique that completely matches the formation of the curls in the weave. This is a picture that shows you where my real hair and where the weave is. My real hair as you can see is dead straight. So then what I do is get a little bit of my hair and also a bit of the weave and wind them round the base of a comb. Then I apply heat using my www.uk.corioliss.com straighteners and unravel the hair – this creates the same kind of curl as the weave! … Voila! I carry on with this curling technique with the rest left out hair and then I’m good to go! The reason part of my hair is left out is so I can put it up like this without revealing the tracks of where my weave starts! Not only has it given me a totally new look but its good for my hair underneath too! It will be basking in its own oils for a couple of months which is healthy, I’m not brushing it daily causing breakage nor am I curling, straightening and applying heat. It promotes the growth of my own hair too. It’s not heavy it doesn’t hurt or pull. It does itch a bit but that’s just at first. I wash it once a week and of course I can straighten curl, blow dry ect. When I wash it, it pings back to the chemical perm that the Brazilian Virgin hair has been treated with. My weave process from start to finish took 4 hours. I’ll be doing another blog post soon showing the styles I can achieve with it and with an amazing brand called Corioliss – Their straighteners and curling wands are amazing, watch this space for more info. But in the mean time – go and get your weave did gurrlllsss! 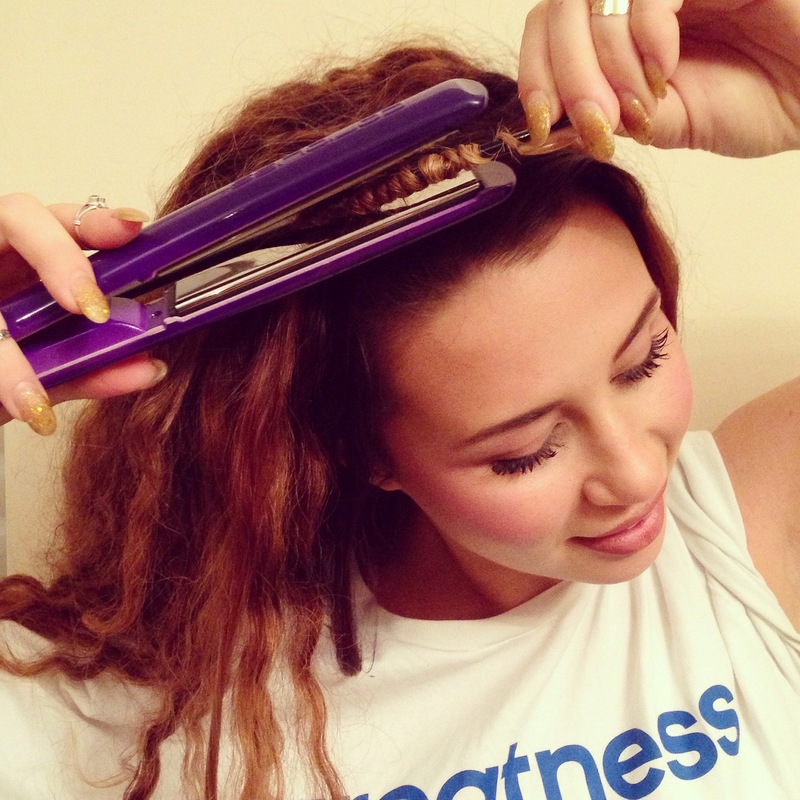 < Corioliss – Better than GHD’s! ?